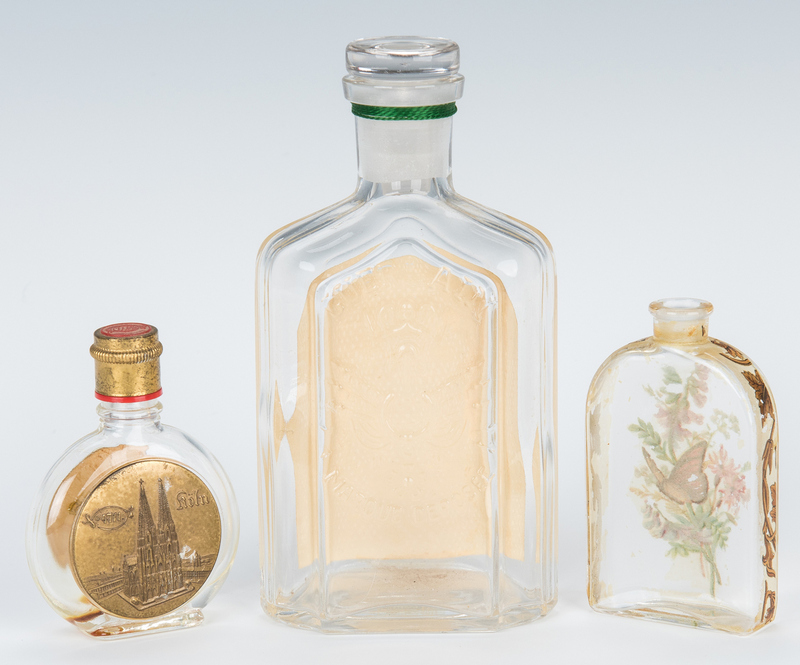 Assortment of twenty-two (21) cologne or perfume bottles and stoppers, including three (3) lavender scent bottles: one (1) with enamel white and orange dots, gilt leaf design, and gilt "St. Louis 1904", one (1) with gilt crosses and floral design, and one (1) with gilt crosses and asterisk design; one (1) pressed glass apothecary bottle Hair Tonic and Dandruff Remover by J.E. 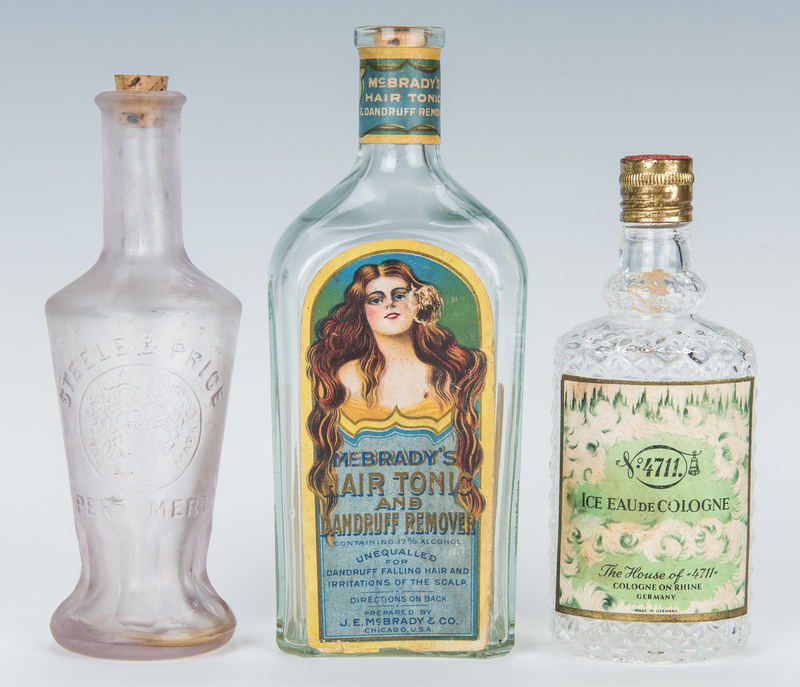 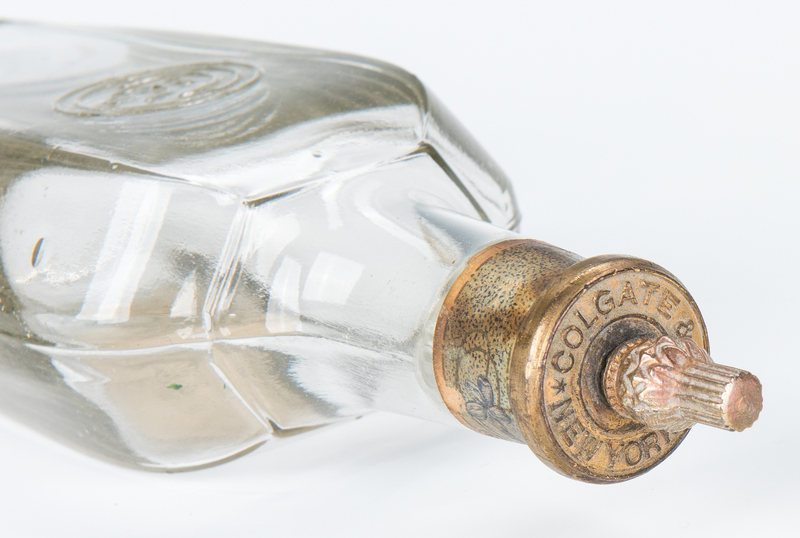 McBrady & Co., front label has image of woman with flowing hair and back label lists directions; one (1) pressed glass apothecary bottle Colgate's Violet Water with front violet motif label and product title, a label around bottle neck with violet motifs and Colgate logo, makers marks on back, and a brass top with applicator; one (1) pressed glass perfume bottle, Veritable Eau De Cologne Imperiale by Guerlain, with product label picturing a crest with ornamental framed design around product title, maker's mark on back, and green thread around neck; one (1) pressed glass perfume bottle, Eau Vegetale Azurea pressed glass perfume bottle by L.T. 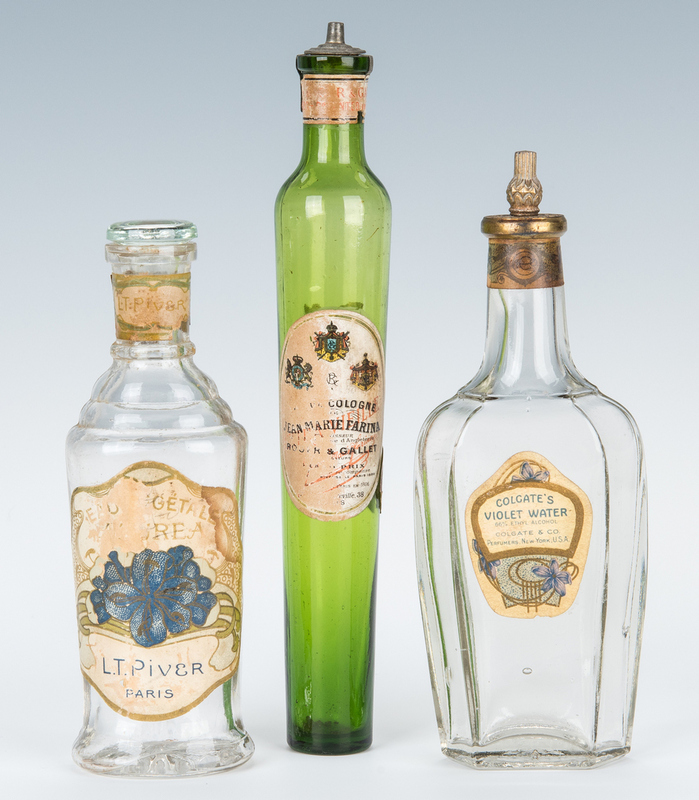 Piver with product label picturing art nouveau design with blue flower and similar bottle neck label with "L.T. 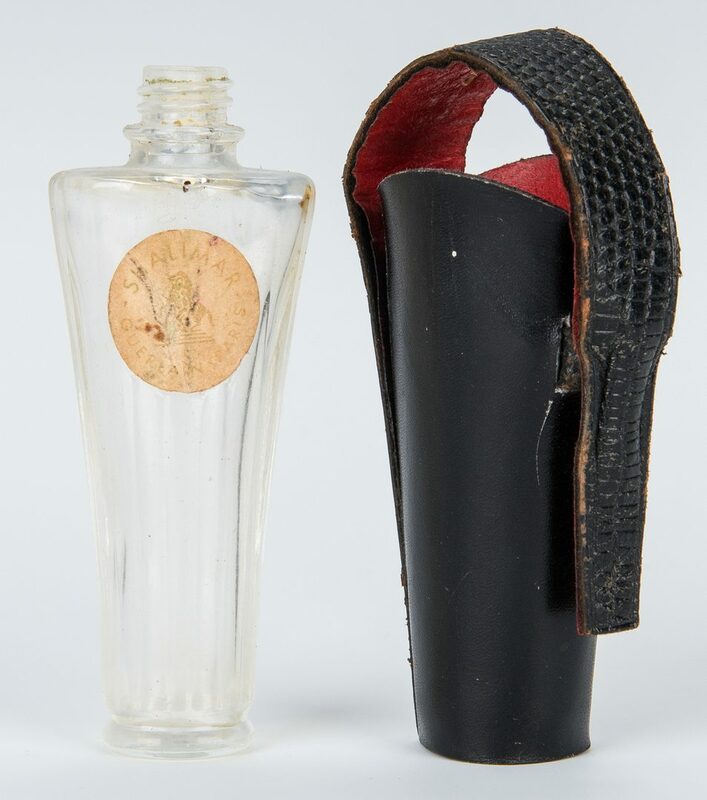 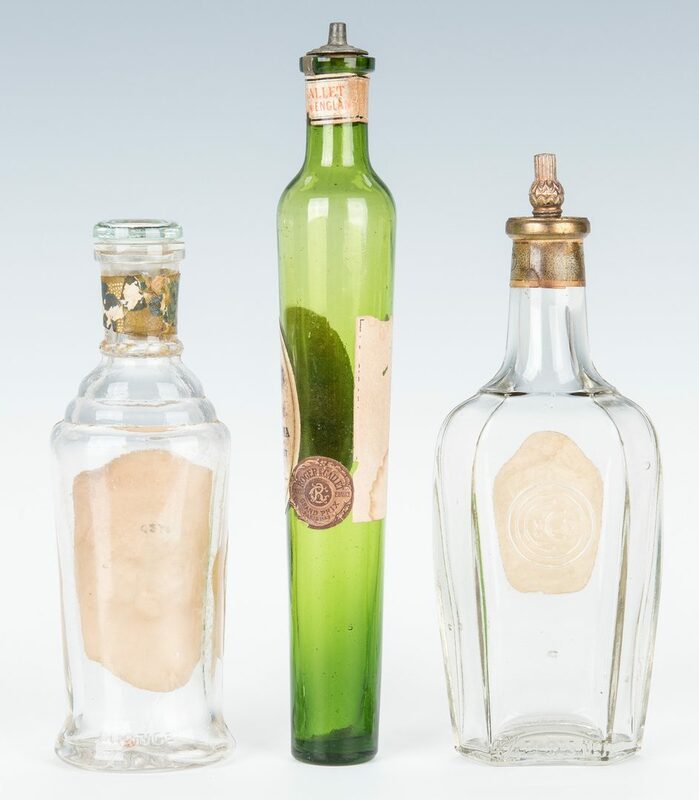 Piver"; one (1) pressed glass scent bottle, German, Ice Eau de Cologne by 4711, with green front product label, base label marked "An Original Product from 4711", and a metal top with Blue and Gold Trademark; one (1) German 4711 brand Eau de Cologne pressed glass scent bottle with Blue-Gold front label, back metal disc embossed with "The Cathedral at Koln", and metal cap; one (1) pressed glass scent bottle, Steele & Price Perfumers, with maker's mark and cork top; one (1) glass bottle with decoupage butterfly and flower design as well as ornamental designs on edge; one (1) pressed glass green bottle, Jean Marie Farina Eau De Cologne by Roger and Gallet for the 1889 Exposition Universalle Paris, with metal lid and slightly worn label; one (1) small pressed glass perfume vial with floral label; one (1) Guerlain Paris Shalimar small pressed glass perfume bottle, missing the lid, and held in a black leather case with red interior and "Guerlain Paris Case Made in France" in gold embossed on handle; one (1) Alice May Perfume Bouquet; one (1) Alice May Perfume Lilac perfume bottle with lilac floral label; one (1) Blumenette glass perfume vial packaged in a metal tube by Henry S. Blumenthal (Paris) and held in a small box with holly pattern; one (1) Young's Violet perfume bottle with cork top, worn front label, and USS Maine 1989 Revenue Stamp; and three (3) glass stoppers: one (1) pressed glass arrow shaped stopper with grooves, one (1) round topped blown glass stopper, and one (1) cut glass stopper with "4" etched on base. 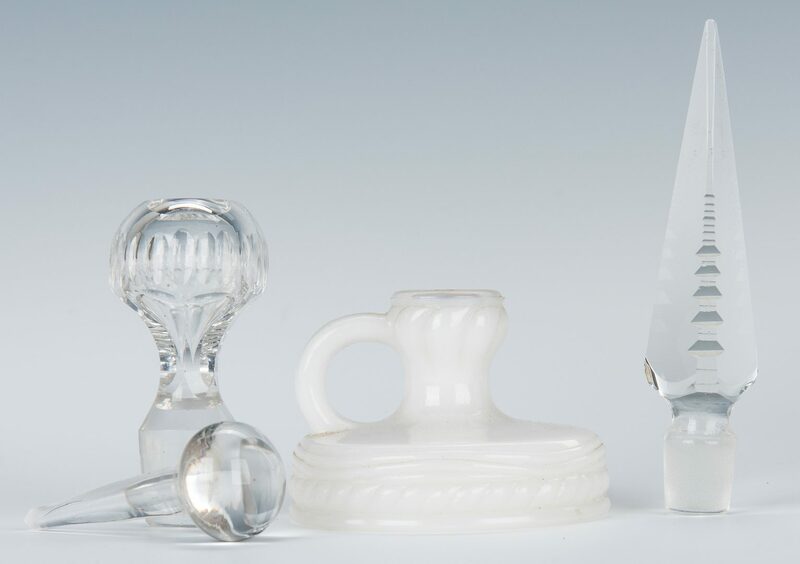 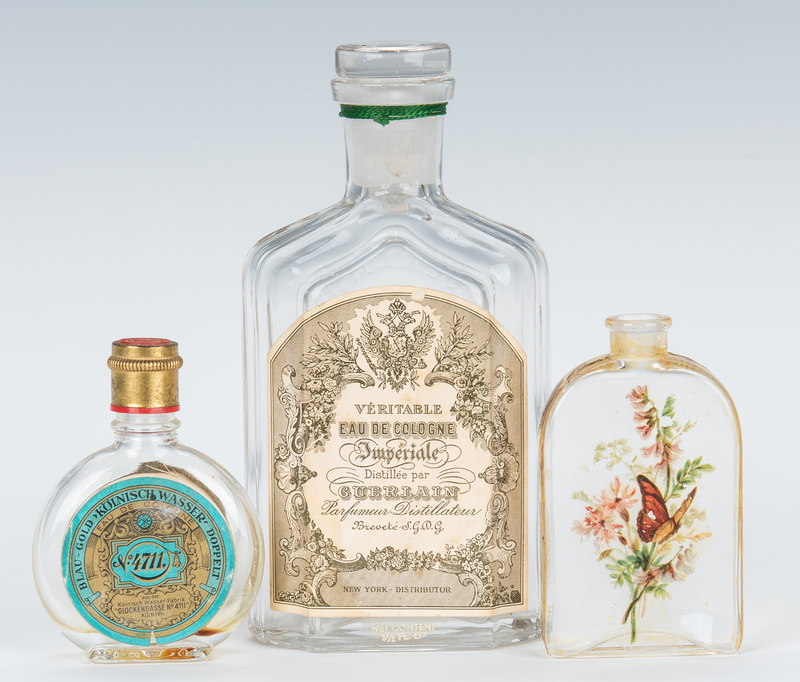 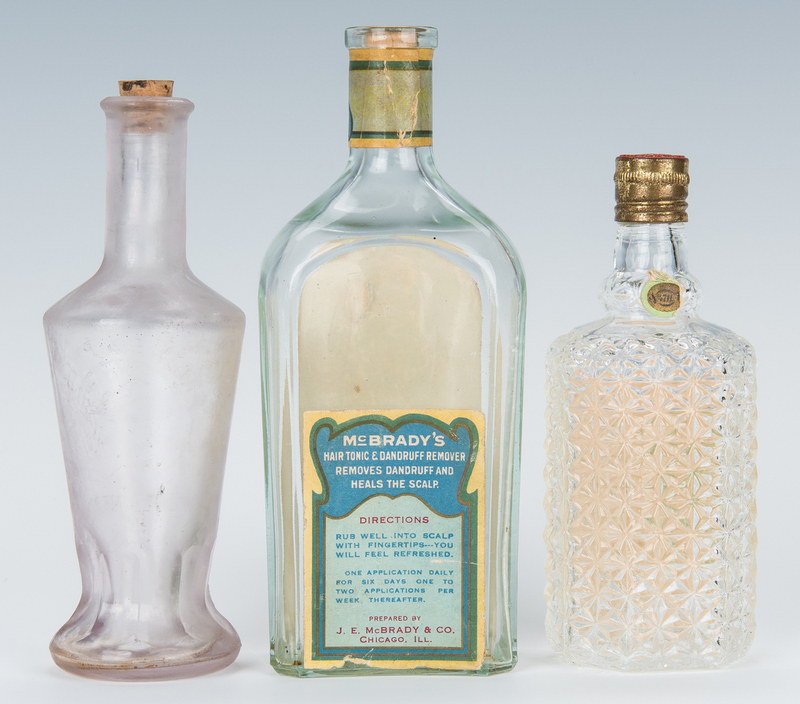 Bottles range in size from 3" H to 8 1/2" H, stopper sizes 2 1/4" to 4" H. All items European and American, late 19th/mid 20th century. 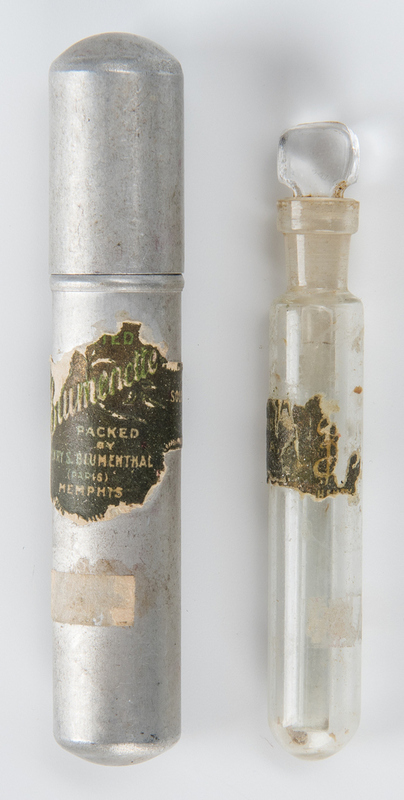 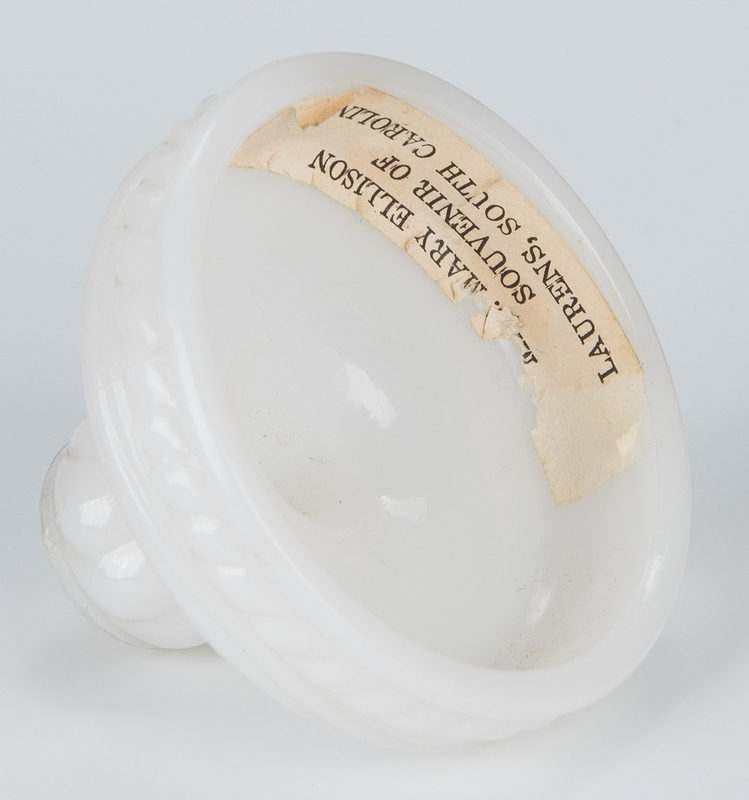 Provenance: Estate of Celia (Cece) Webb, Nashville, TN. CONDITION: Good condition with normal wear to designs and surface.